'He's Doing A Good Job': Supporters Rally Nationwide To #March4Trump : The Two-Way Demonstrators gathered in cities and outside state capitols to heft signs and chant slogans in support of President Trump on Saturday. In many places, counterprotesters were also there to meet them. 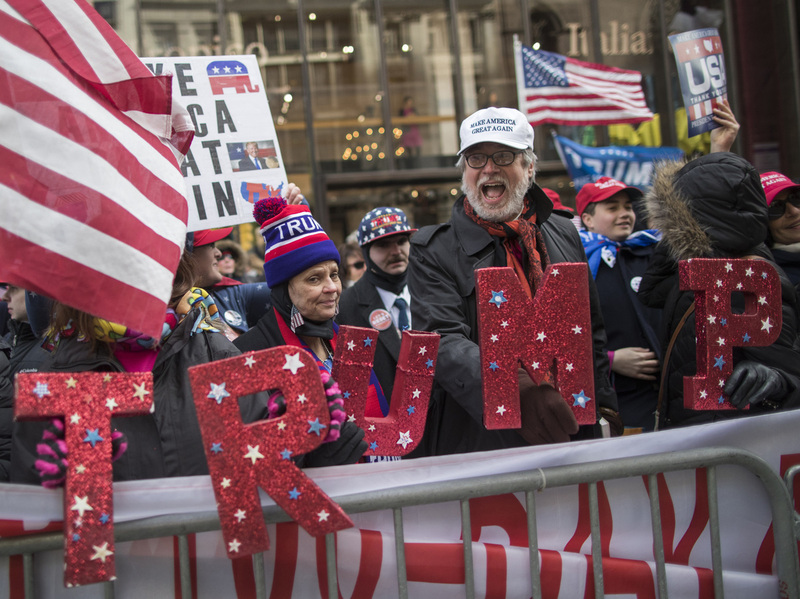 Supporters of President Trump chant slogans during a Saturday rally on Fifth Avenue near Trump tower in New York City. Supporters of President Trump are gathering at locations across the U.S. on Saturday, in a bid to challenge what rally organizers call the country's "seditious fringe." In a series of demonstrations dubbed the "March 4 Trump" — or the Spirit of America Rallies — organizers have pledged to provide "forgotten voices a mechanism so they can be heard." "They aren't giving [Trump] a chance," Patty Collins, a local organizer, told The Indianapolis Star. "We are here to show support for the president of the United States." Saturday's demonstrations — which were intended to be small, according to the Main Street Patriots — come just one week after Trump tweeted something of a call for rallies backing his administration. "Maybe the millions of people who voted to MAKE AMERICA GREAT AGAIN should have their own rally," Trump tweeted. "It would be the biggest of them all!" From New York City to Raleigh, N.C., from Austin to Washington, D.C., Trump supporters answered that call — though in many instances, counterprotesters were also there to meet them. "The two groups continued to trade taunts — 'Get a job!' was one volleyed at the counterprotesters — and chants and shouts reverbated through the rotunda. Someone — it was unclear who, except that it was not police — sprayed a chemical irritant, causing some scattering and coughing on both sides. "At least two people were arrested." Kerfuffles like the one in Minnesota broke out elsewhere, as well. Outside the Texas State Capitol in Austin, where police estimate roughly 300 supporters gathered, Taylor Goldenstein of the Austin Statesman witnessed heated confrontations between the two groups amid chants of "No Trump, no KKK, no fascist USA!" Those skirmishes were broken up by police without serious injury. For the most part, however, the demonstrations have been peaceful — and in Austin, at least, charitable as well. The Austin American-Statesman notes that pro-Trump "attendees are told to bring donations for the homeless and veterans, such as canned goods, clothing, blankets and hygiene products, according to the [organizers'] Facebook page." "There have been so many protests against [Trump], we just want to spend a day showing him there are people who support him," Jennifer Drabbant, a local organizer, told the Statesman. It was a sentiment echoed at the D.C. rally, where a man who identified himself as a registered Democrat told the gathering he was frustrated with the worldwide women's marches the day after Trump's inauguration. Most of the people who joined those marches expressed opposition to the new president's agenda. "He was in office less than 24 hours," the man told the crowd from stage. Meanwhile, Michigan Public Radio's Cheyna Roth reports "it was a clash of the signs and chants" outside the State Capitol on Saturday, as demonstrators gathered near counterprotesters. "He's doing a good job, I think," Trump supporter Trent Herbert told Roth. "I think a lot of times he should stay off Twitter." Christy Trammell of Franklin, Tenn., says she's attending the Nashville demonstration — her first political rally — as a direct response to January's women's marches. "Seeing the people there that were trying to act like they represent women," she told Blake Farmer of member station WPLN, "it was appalling to me." Farmer reports that the Nashville rally, which wasn't quite as big as organizers would have liked, nevertheless voiced their support of Trump's proposed wall along the border with Mexico, as well as rolling back transgender bathroom protections. Still, in Nashville, as elsewhere, protesters persistently chanted slogans from the edges. Organizers of one counterprotest in D.C. summed up their motivations behind showing up in opposition. "We won't sit idly by when Trump supporters come to town and celebrate: fear, hate, and misogyny," Smash Racism DC wrote on its Facebook page.